A spiralizer makes quick and easy work for cutting the zucchini into noodles, or use a mandoline with a julienne blade, slicing lengthwise. For the relish, whisk together 2 tsp. oil, balsamic, and garlic, season with salt and pepper; toss with tomatoes. Add basil just before serving. For the chicken, combine Italian seasoning, granulated garlic, 1/2 tsp. salt, and 1/2 tsp. pepper; rub onto chicken. Heat 2 tsp. oil in a nonstick skillet over medium-high until shimmering. Add chicken and cook until a thermometer inserted into the thickest part registers 165°, about 5 minutes per side. When cool enough to handle, slice chicken. For the zoodles, add zucchini, relish, and mozzarella to same skillet and cook just until zucchini and tomatoes soften, 2 minutes; season with salt and pepper. 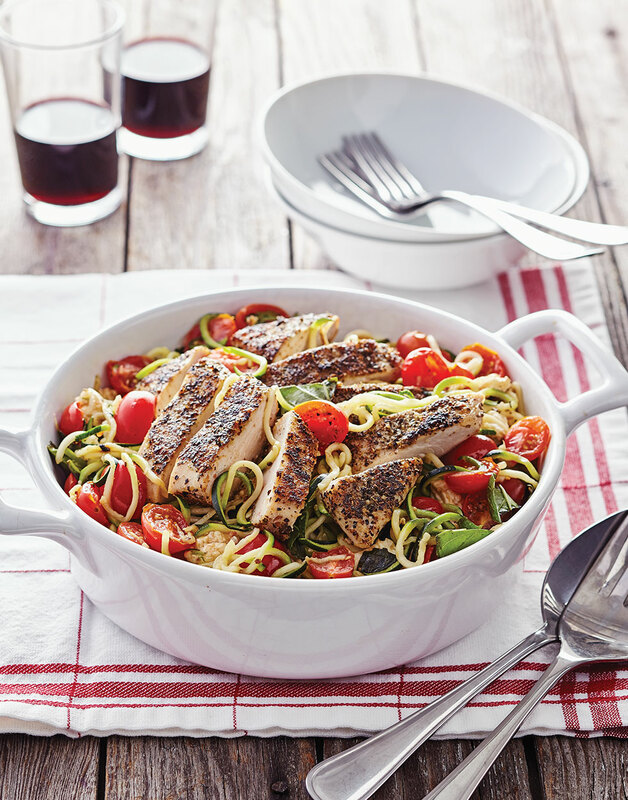 Serve chicken with zoodles. To prevent the basil from turning black, wait to add it to the relish until just before serving it. To keep from shredding the meat, pound it in a resealable plastic bag with a teaspoon of water inside. The zucchini, relish, and mozzarella just need to heat through, so just cook them briefly.